I really can't believe we're only a few days away from celebrating our first wedding anniversary! Matthew said last year that it felt like it took forever to get to our wedding day, and I on the other hand thought it flew by. Today I'm sharing our photos from our actual engagement in Paris captured by our amazing photographers Michael & Carina. We had spent most of the day traveling around near Loire Valley and drove up to Paris to get to our Airbnb. It had rained and of course my hair was out of control and messy (yes that is significant to the story) haha. Once we found our apartment I wanted to run upstairs and freshen up and change clothes since we had been walking around in the rain most of the day. I grabbed a few bags and met the owners of the Airbnb and took the bags upstairs. Unbeknownst to me I accidentally grabbed the bag that had the ring in it ... whoooops! I went back downstairs to the car to tell Matthew we were all set and he "needed" to go upstairs. So I stayed with the car and he came back down and told me we had to leave for our dinner reservation. Now ladies ... we're in PARIS and I had so many cute outfits with and I needed to dry my hair and put fresh makeup on and he absolutely wouldn't let me. The nerve right? Haha. 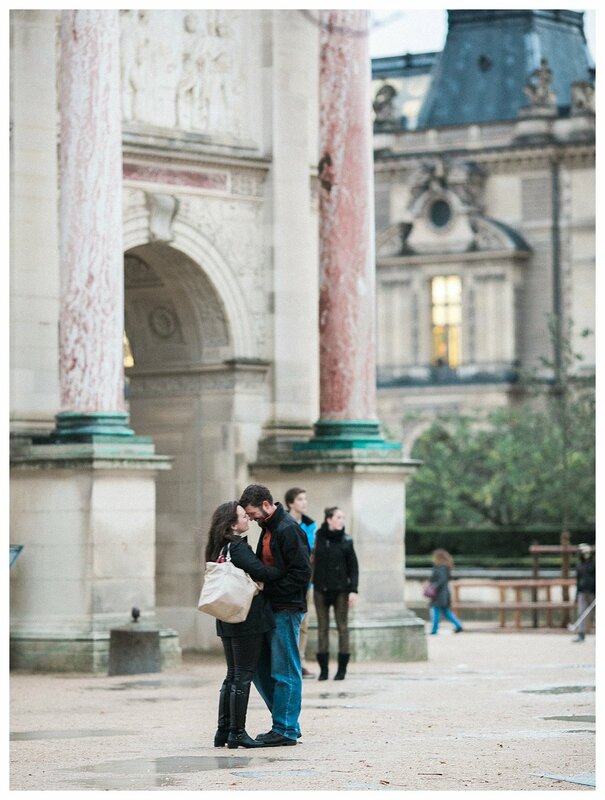 A caveat to all of this, I knew we were going to get engaged on our trip as we had made plans with our photographers to fly out there and capture our engagement session. But I had no idea when or where this would happen. So I begrudgingly stayed in the car and off we went. We parked the car and I had my camera gear with me and a few other things and I didn't want to leave it in the car. So I lugged my huge bag with. 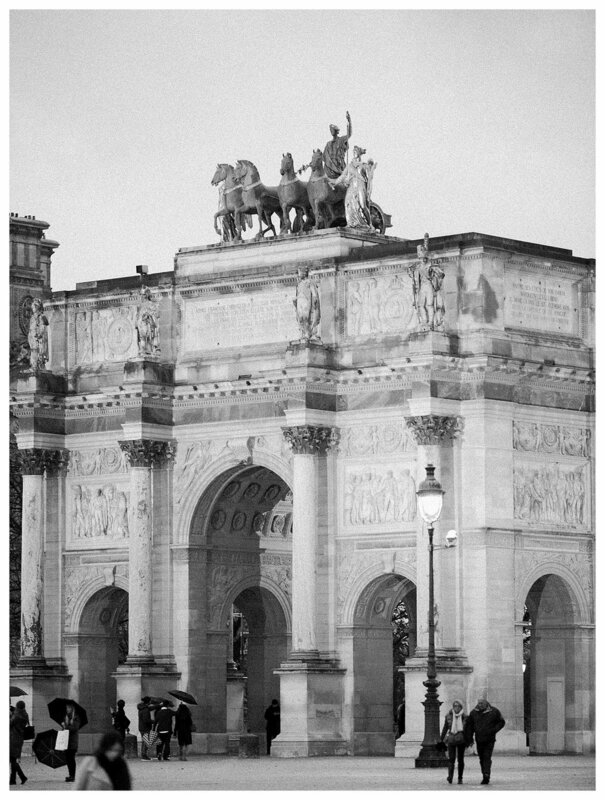 We walked past the Louvre and on to the Arc de Triomphe du Carrousel. The view was absolutely gorgeous and before I knew it, he turned me around and proposed. I'm pretty sure my mind went totally blank and all I could think of is how much I loved him and how excited I was to become his wife. Pure magic. Little did I know that he had secretly planned to have Michael & Carina there hiding to capture our proposal. 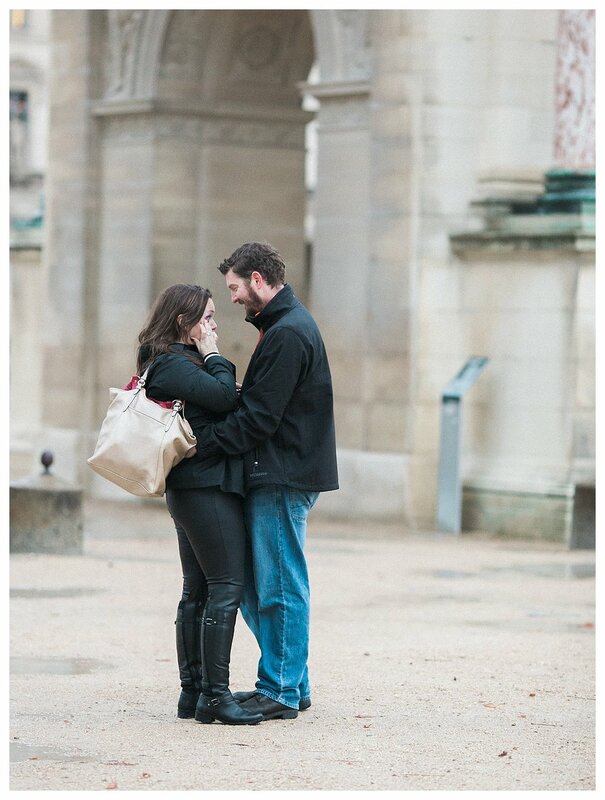 I was totally surprised and beyond happy that we had this amazing moment captured. My heart still skips a beat looking at these pictures!